Can You Lay New Roof Shingles Over Old? The answer is yes, you can lay new roof shingles over old ones. Now that we've taken care of the primary question at hand, we'll consider a couple of reasons why you might want to do this. Then we'll look a lot more reasons why you might not want to do this. But before we get started, one thing must be clear: adding new roofing over old (sometimes called a "re-roof") is possible only with asphalt shingles (also called "composition shingles"). You can't do it with wood or slate, for example, and you should never mix materials, such as laying asphalt shingles over cedar shakes. Also, the old roofing has to be in pretty good condition. Otherwise you're just putting lipstick on a pig. Why Add New Roof Shingles Over Old? Contrary to what might seem like an obvious benefit, having multiple layers of shingles does not necessarily make a roof more waterproof, and it often creates its own problems. So why would you lay new roof shingles over old? Convenience and cost. If you keep the old shingles on, you skip the messy, laborious removal step -- called the "tearoff" -- and you'll save some money on the roof job. However, both of these benefits have caveats. It's clearly easier and cheaper to leave the old shingles in place, but there's some special prep work involved with a re-roof (removing vents, ridge caps and misshapen shingles, among other things) and you still have to replace or add new flashing, which sometimes can be tricky over old roofing. Eliminating the tearoff can easily save $1,000 or more on a new roof, but you're really just delaying the cost: when it's time to replace the roof again and you have no choice but to start anew (two layers is the maximum allowed in most areas), you'll have to pay extra for the two-layer tearoff and disposal. Why Not Add New Roof Shingles Over Old? As suggested above, the potential cons of re-roofing tend to outweigh the potential pros, but it all depends on your situation. The following list includes some universal reasons not to reroof as well as some considerations or things to check out if you're seriously considering adding new roof shingles over old ones. 1. Shingles are designed for flat surfaces. They don't do a good job of bridging over gaps, dips or humps, including the stepped texture created by overlapping shingles. 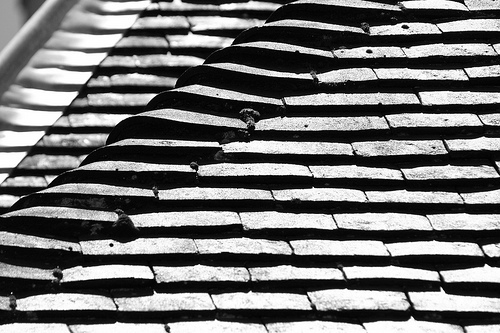 Re-roofers have tricks to lay new roof shingles over old so that the same step-ups between courses are maintained, but if any old shingles are cupped, curled, or otherwise misshapen, those defects will "telegraph" through to the new layer. Many roofers recommend using laminated, or dimensional, shingles for re-roofs because they're thicker than standard shingles and often have a staggered edge profile (for looks) that helps hide any dips or high spots in the old roofing. 2. Shingles add weight. Good-quality composite shingles can weigh 350 to 450 pounds per "square" (100 square feet of roofing, installed). Chances are, your roof structure was designed for a dead load of one layer of shingles, plus extra for snow and a safety margin. Installing new roof shingles over old effectively doubles the weight of the roofing, so you have to make sure your roof structure can handle the extra load. That's also why building codes commonly limit re-roofing to no more than two layers. On some houses, the extra weight of multiple layer causes the roof sheathing (decking) to sag between the rafters or trusses. 3. No visual inspection of roof sheathing. Without a tearoff, roofers can't see what the decking looks like. A good roofer will perform a careful "walking" inspection for spongy areas and other problems, and they can make localized repairs before re-roofing. A not-so-good roofer might be less conscientious. 4. Can't replace underlayment. The building paper (tarpaper) that's laid between the roof sheathing and the shingles is there for a very good reason -- because water has a way of getting under shingles, no matter how many layers of roofing you have. If the underlayment is old and deteriorated, it won't protect your roof deck from water that gets past the shingles. In snowy climates, most new roofs these days get an ice-and-water shield (a rubbery moisture membrane) applied to the sheathing along the eave to protect against ice dams. Adding this membrane isn't an option with a re-roof, and the extra layer of shingles offers little protection against ice dams. 5. Re-roofing may affect the warranty on the new shingles. Pretty self-explanatory. Be sure to check with the shingle manufacturer regarding all warranty issues and installation requirements before re-roofing. 6. Local codes might not allow re-roofing. Two layers is the maximum in most areas, but some building codes allow only one. For example, towns in climates with heavy hailstorm activity or significant ice dam problems may not allow multiple roofing layers. 7. A re-roof might not look good on an inspection report. Adding new roof shingles over old ones is tempting to a lot of people planning to sell their house in the near future: why pay for a tearoff if you can get away without it? Of course, it'll be the new owners who are stuck with the extra expense of a two-layer tearoff down the road, along with any problems arising from an improper re-roof job. Because of this, home inspectors often report double-layer roofs when they find them, and they may warn the buyers of potential problems associated with re-roofs. If you're planning to sell your house after installing a new roof, it's a good idea to discuss your options with local real estate pros and/or home inspectors. Contact a reliable roofing contractor to discuss your options for roof repair or replacement.